KOTA KINABALU: Three shops in a shopping centre selling various fake electronic gadgets using Vivo as its brand were uncovered in a raid by an enforcement team of the Domestic Trade and Consumer Affairs Ministry Sabah office, here, Wednesday. Its Enforcement Chief, Ravichandran A/L Vadivellu, said 192 units were seized in the raid comprising 105 mobile phones, 10 tablets, 10 handphone chargers and 58 power banks worth RM25,959.00. He said three enforcement teams comprising 15 enforcement officers busted the three shops at 11am after receiving public complaints and information from the Vivo trademark owner. 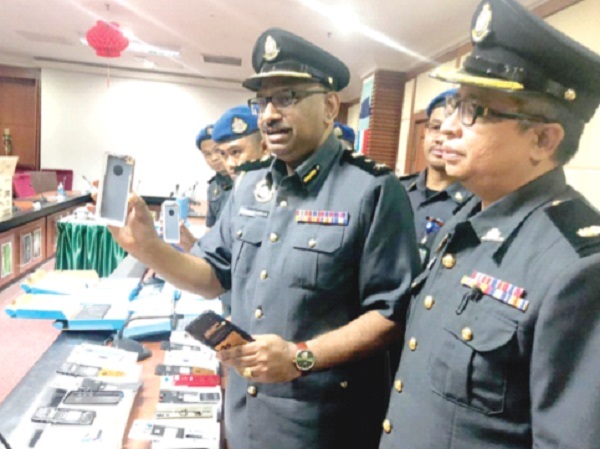 “Upon inspection on the first premises, we confiscated 81 units of mobile phones, nine mobile accessories such as handphone chargers and power banks, believed to be imitation, worth RM14,152. “At the second premises, we seized 15 mobile handphones, 46 power banks, one handphone charger and nine tablets worth RM7,506 and at the third premises, nine mobile handphones and 10 tablets worth RM4,301,” he said in a press conference at the KPDNKK Sabah office. Ravichandran said it was stated that the fake Vivo mobile phones were manufactured in Malaysia but in actual fact the products were manufactured in China. “The gadgets are being put up for sale at lower prices than the original Vivo products and there are also models that have never been produced by the brand. “There are various features that distinguish the seized mobile phones and accessories from the genuine ones. These include the mobile handphone batteries that should not be taken out of the gadgets, there are two cameras at the rear of the phone but when the back cover is opened, only one camera is shown. “In addition, Vivo does not produce tablets and power banks and the fingerprint sensor on the mobile phone is not functioning as it is only being used as a decoration,” he said.